Do you have an ESA, an emotional-support animal, “a companion animal that provides therapeutic benefit”? Patricia Marx wrote about the issue recently in her article Pets Allowed. The subhead: Why are so many animals now in places where they shouldn’t be? Like llamas at the grocery store? I was all ears. Accompanying the piece was a photograph captioned with the wonderful line, “Tea at the Four Seasons in Boston with an emotional-support pig.” Who wouldn’t want that? Crazy people who want to have tea at the Four Seasons pig-less? Seriously? It was music. A childhood fairy tale. Mary taking her lamb to school. Pure poetry. 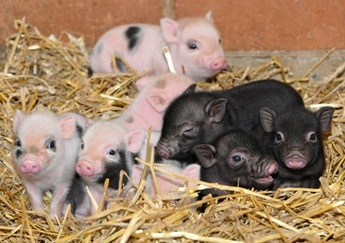 Because, as you know, I have a near-obsession with the teacup pig. SO KEWT! I wanted a teacup pig so badly last year when we were casting about for a family pet, but I was overruled, and we got a dog. However, instead of being my emotional-support animal, she’s more of a pain in the neck. Of course, I love her. But she raises my blood pressure instead of bringing is soothingly down as the research suggests is the benefit of pet-ownership. Plus she barfs from anxiety when I’m not around, she freaks out. I am her emotional-support animal. Clearly, I need a pig who can be there for me. But there are people who suggest emotional-support animals are a scam. It’s a piece of cake (or dog biscuit, or rabbit food, or whatever llamas eat) to register your animal as an ESA. Simply click here and follow the directions. Step one: Confirm you have some type of emotional or psychological disability. Being middle-aged, a parent of young kids, and in chronic pain, I have several. I may need a whole lot more than one emotional-support pig. I might need a litter. At times, interfacing with emotional support animals is unsanitary and inconvenient. But that has more to do with irresponsibility of the owner (i.e. not properly containing the animal or cleaning up behind it, etc). That said, I am keenly aware of the benefits of having such support. Whilst my grandfather was ailing, his only source of joy was his beloved dog, Sooner. When it came time to modify my grandfather’s living arrangements, which happened to include moving him to a different state, Sooner’s presence was the only way my grandfather would agree to get on the plane. Or be moved for his own good, period. All told, to deal with this phenomenon, I believe society must enter into an unspoken agreement: I won’t totally freak about your emotional support pet, and in turn you’ll do everything in your power to ensure that your pet is solely for your support, and not a hindrance/annoyance/threat to me. Y’know, the same agreement we have with parents and kids.